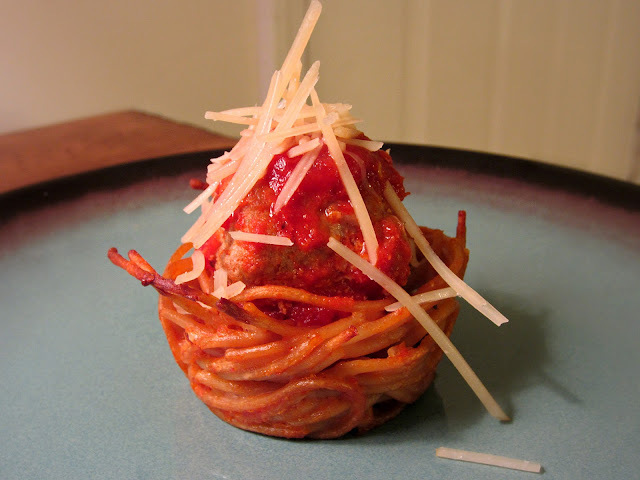 Sugarcoated: Spaghetti and Meatball "Cupcakes"
Savory stuff doesn't make it here too often. But there's just something about dinner in cupcake form that gets me all warm and fuzzy inside. This post was no exception. I wanted to hug these "cupcakes". But that would have been messy. Spaghetti and meatballs is a classic. It's comfort food. And what could be better than being able to pick up your dinner by HAND and eating it?!? Come on, people. There is nothing better than that. I will just cut right to the chase. These are yummy. They aren't so bad for you either. I used whole wheat pasta and ground turkey for the meatballs. You won't feel guilty eating 3. or 27. Although the recipe doesn't make that many. I promise if you don't gorge, there will be some to bring to work the next day. It will be like opening a Christmas present in your cubicle. 1. Pre-heat the oven to 350. Line a baking sheet with aluminum foil then lightly mist it with cooking spray and set aside. 2. In a large bowl, combine the bread crumbs, egg and skim milk and stir until mixed. Add the ground beef and stir in until thoroughly combined. Split the meat mixture into 12 equal pieces and roll them into balls. Set the balls on the prepared baking sheet and put them in the over to bake for 25 minutes at 350. 3. While the meatballs bake, bring a large pot of salted water to a boil and cook the broken spaghetti pieces according to package directions. Drain the spaghetti and set it aside to cool (I actually stuck mine in the fridge for a few minutes. It doesn’t need to be cold, but you don’t want it to be too hot to handle when you press it into the cups). 4. When the meatballs are done, remove them from the oven and place them in a saucepot with 1 ½ cups of marinara sauce. Bring the meatballs and sauce over low heat on the stovetop, just to keep it all warm. Stir occasionally. Turn the heat on the oven up to 400 degrees. 5. When the pasta is cooled enough to handle, whisk the egg whites together in a large bowl and then add the pasta. Stir to combine and then add the Parmesan, Mozzarella, and 3 tablespoons of the marinara sauce. Mix together until thoroughly combined. 6. Lightly mist a 12 cup muffin tin with cooking spray. Place about 1/3 cup of the spaghetti mixture into each cup in the muffin tin. Using your fingers, press down on the center and up the sides of the spaghetti, forming cups. Slide the tin into the pre-heated oven and bake for 15 minutes at 400. 7. 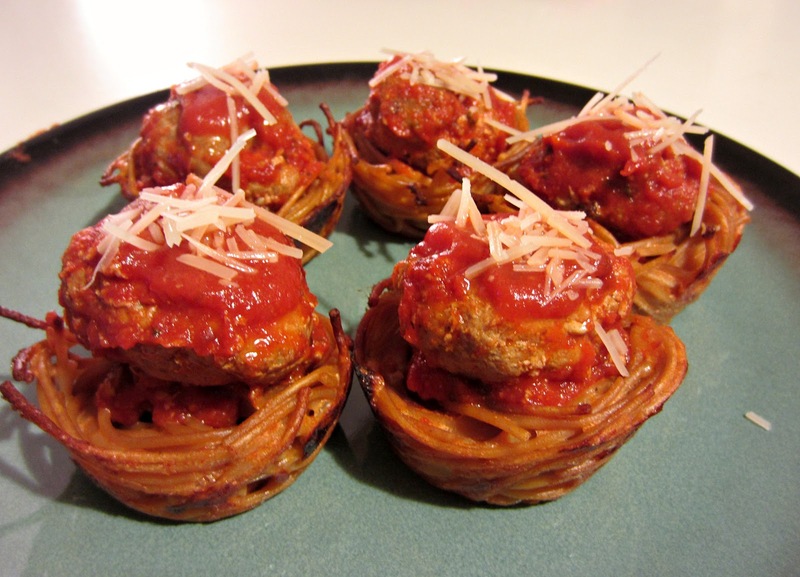 When the spaghetti cups are done, remove them from the oven and let them cool for a moment before removing them from the tin. When ready to serve, pour a tablespoon of marinara sauce from the pot into the center of a spaghetti cup, top it with a meatball, and follow it with another tablespoon of marinara. If you make these, I'd love to know how they turned out. Does anyone have other "dinner cupcakes" they have tried out?